October was Breast Cancer and AIDS Awareness Month so one saw innumerable red and pink ribbons pinned to untold sympathetic lapels. It was also Dental Hygiene, Down Syndrome, Lupus, and Rett Syndrome Awareness Month. All worthy causes which surely deserve their own ribbons –– even if one wonders if Rett Syndrome is somehow related to Scarlett Fever. And November begged us to be aware of Diabetes, Epilepsy, Impotency, Lung Cancer, Pancreatic Cancer and Prematurity. A cavalcade of sheer worthiness which still might leave the empathy-challenged among us begging for a Compassion Fatigue Awareness Week. But the point is that we should all proudly don ribbons commemorating our maladies of choice as though they were medals in a war against humankind's single greatest enemy –– feeling sicky. 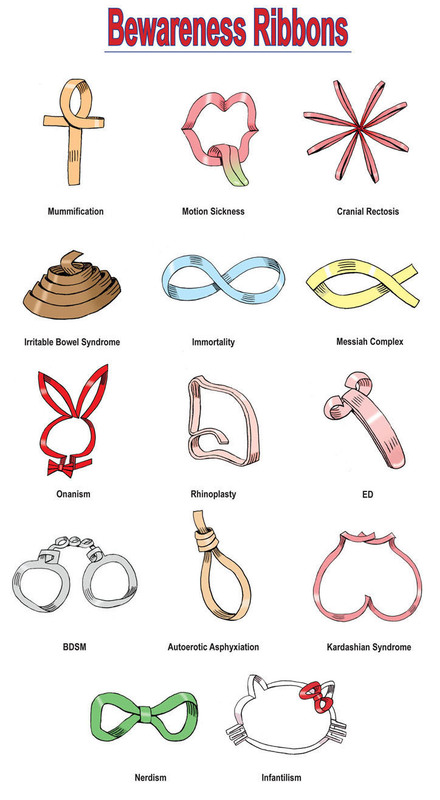 Thus we offer these unique ribbon designs to raise –– what else –– awareness of certain less-hyped, but still pretty dire, conditions of the body, mind and spirit.